Alice In Wonderland: Purrplexity! – Purrplexity is a new Hand-painted Limited Edition Cel featuring the grinning Cheshire Cat. 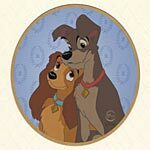 Lady & The Tramp: Golden Anniversary – This is a new Limited Edition Sericel featuring several key moments that portray the much-loved canine cast from Walt Disney’s Lady and the Tramp. Sleeping Beauty – Fire & Fury is a Limited Edition Cel featuring the unforgettable battle between Prince Philip and Maleficent..
Lady & The Tramp – Portrait Of Love is a beautiful hand-inked and hand-painted Limited Edition Cel capturing the special romance between Lady and Tramp. Monsters, Inc: Scream Team – Sulley and Mike are discussing the day’s activities in Disney’s 2001 feature film about the scary monsters in the closet. This fine art Limited Edition Giclee On Paper captures the rich color and detail of the actual film moment.